At a time when both scholars and the public demand explanations and answers to key economic problems that conventional approaches have failed to resolve, this groundbreaking handbook of original works by leading behavioral economists offers the first comprehensive articulation of behavioral economics theory. Borrowing from the findings of psychologists, sociologists, political scientists, legal scholars, and biologists, among others, behavioral economists find that intelligent individuals often tend not to behave as effectively or efficiently in their economic decisions as long held by conventional wisdom. The manner in which individuals actually do behave critically depends on psychological, institutional, cultural, and even biological considerations. 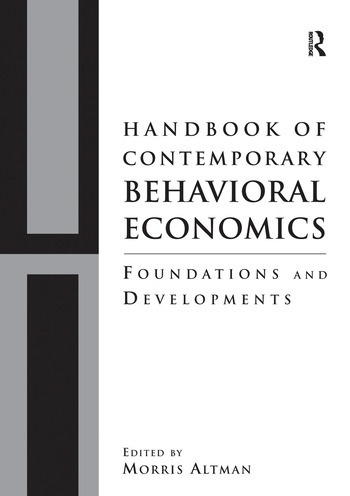 "Handbook of Contemporary Behavioral Economics" includes coverage of such critical areas as the Economic Agent, Context and Modeling, Decision Making, Experiments and Implications, Labor Issues, Household and Family Issues, Life and Death, Taxation, Ethical Investment and Tipping, and Behavioral Law and Macroeconomics. Each contribution includes an extensive bibliography.